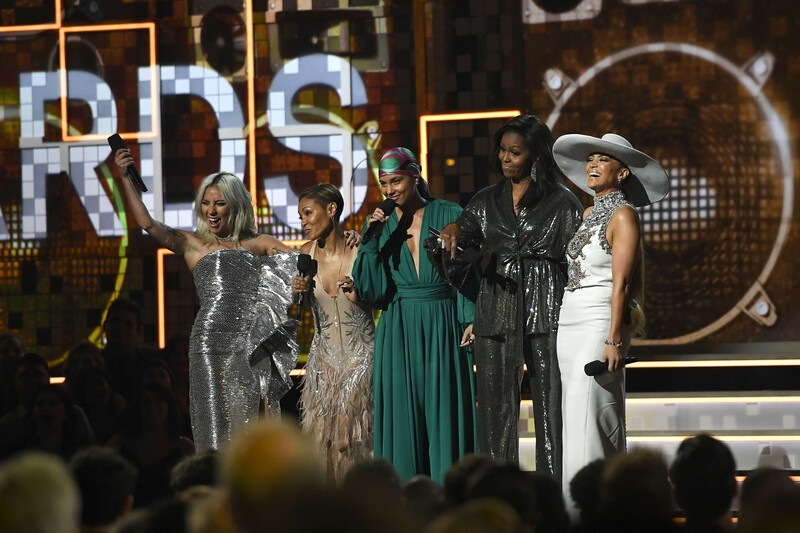 The star-studded Grammys kicked off with a decidedly feminist bent on Sunday, with a series of girl power performances and a surprise appearance from former first lady Michelle Obama to open music’s biggest night. Hip-hop artists and a bevy of talented women were leading the pack, with early awards going to Lady Gaga, folk rocker Brandi Carlile and Childish Gambino, who scored three awards — including his first major trophy for Song of the Year — for the provocative hit ‘This Is America’. ‘Invasion of Privacy’ beat out albums by the late Mac Miller, Nipsey Hussle, Pusha T and Travis Scott. Cardi B is just the fifth woman ever nominated in the category, which was created in 1995. Lauryn Hill was part of the Fugees when the group won in 1997 for ‘The Score’. Cardi B took the stage at the Staples Center holding the hand of husband, Offset, with whom she has reunited after marital issues last year. Holding the trophy in her white-gloved hands, Cardi B thanked “you husband” and the couple’s daughter, who was born seven months to the date. “I’m sorry, I just, oh the nerves are so bad,” she said. Cardi B told the crowd she found out she was pregnant before her album was completed. She was under pressure to finish it and do video shoots before she began showing. Cardi B had one of the show’s memorable performances, twerking on a piano and strutting with peacock-like plumage attached to her hips while singing ‘Money’. Her necklace fell off mid-song but she kept on going. Lady Gaga delivered another emotional rendition of ‘Shallow,’ from the Oscar-nominated film ‘A Star Is Born’. The duet, which she performs in the film with director and co-star Bradley Cooper, was all Gaga inside the Staples Center. The singer returned to her fierce pop roots in front of a backing band that included fellow songwriters Mark Ronson, Anthony Rossomando and Andrew Wyatt. Unlike her film alter ego, Gaga did not shy away from the camera. Instead she embraced the extreme close-ups and dance elements of the song, opting for glitz on the smoke-filled stage rather than the usual stripped-down performance of the single. Gaga, who helped host Alicia Keys open the show with Michelle Obama, was up for five Grammys on Sunday, four of which were for ‘Shallow’. She scooped up song written for visual media and pop solo performance earlier that night. Even though he skipped the Grammys to attend the Bafta Awards in London, Cooper won his first Grammy Award during the Grammy Premiere Ceremony. He’s slated to join Gaga to perform the Oscar-nominated song at the Academy Awards on February 24. The musical film is up for eight Oscars. Obama’s initial comments were interrupted by raucous applause and many in the Staples Center crowd stood. She smiled and eventually re-started her comments. “From the Motown records I wore out on the South Side to the Who Run the World songs that fuelled me through this last decade, music has always helped me tell my story, and I know that’s true for everybody here,” Obama said. Cornell’s daughter, Toni, and son, Christopher, accepted their father’s trophy for best rock performance for his song ‘When Bad Does Good’. The song was released as part of a posthumous album of unreleased music that Cornell’s estate put out last year. The musician died at the age 52 in 2017. His death was ruled a suicide. The Latin singer-actress hit the Grammys stage inserting her energetic dance-pop flavour into memorable Motown melodies such as ‘Dancing Machine’ and ‘Dancing in the Street’. She faced backlash on social media for her lead participation in a tribute recognising a historic African-American record label. Some online questioned why a black artist wasn’t chosen instead of Lopez, but she did received support from Smokey Robinson, who joined her in a duet to perform ‘My Girl’, a song he co-wrote. She then briefly teamed up with Alicia Keys on ‘Papa Was a Rollin’ Stone’ and sang ‘Another Star’ with Ne-Yo, who played the piano. 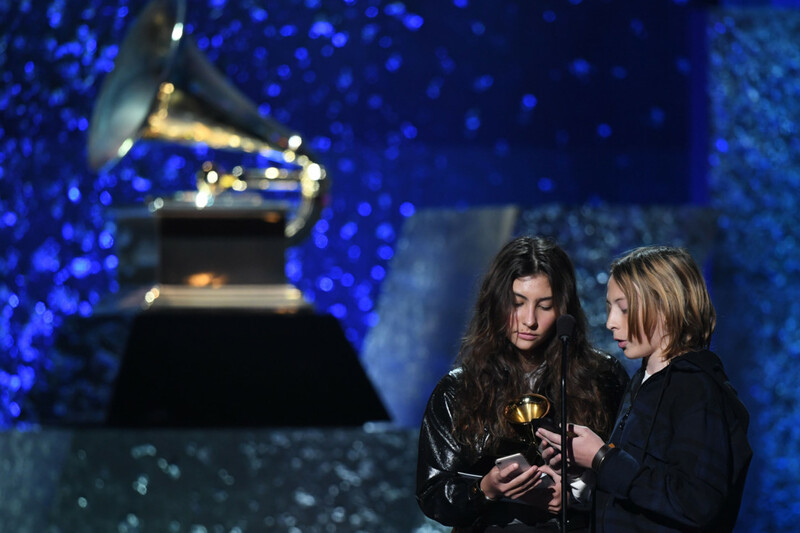 English singer-songwriter Dua Lipa on Sunday bested a crowded field of female talent to take home the Grammy for Best New Artist. The synth-pop star beat out fellow Londoner Jorja Smith along with rising pop singer-songwriter Bebe Rexha and the enigmatic R&B performer H.E.R. Lipa’s breakthrough came in 2016 with her first global hit ‘Hotter than Hell,” which she followed with ‘Blow Your Mind (Mwah),’ which busted into the US Billboard Hot 100. Her sixth single ‘New Rules,’ which came off her self-titled debut studio album, was her first number one in Britain — and the first by a female solo artist to top the UK charts since 2015’s ‘Hello’ by Adele. “For anyone who hasn’t realised how special they are to have a different story, a different background, a name, and just want it be normal... just know that no matter your background, what you believe in, never let it get in the way of your dreams,” she said in accepting her award. The 23-year-old was born in London to parents who emigrated from Kosovo; her father moonlighted as a rocker in the Kosovar band Oda, in which he was lead vocalist. Ariana Grande has tweeted and quickly deleted criticism of the Grammys after the late Mac Miller — her ex — lost to Cardi B for rap album of the year. Grande called Miller’s loss during the show “trash” and also used an expletive. She later clarified she wasn’t criticising Cardi B.
Miller died of an accidental drug overdose last year at age 26. Grande got into a war with the producer of the Grammys a few days ago, claiming Ken Ehrlich’s assertion that she didn’t have enough time to prepare a performance a lie. Grande won a Grammy for best pop vocal album but did not attend. Childish Gambino won the prize for song of the year at the Grammys Sunday for ‘This is America’, becoming the first hip-hop act to ever win song of the year. Childish Gambino is the musical alter ego of actor Donald Glover. He also won best music video during a presentation earlier in the day. Though hip-hop and R&B have supplanted rock as the most popular music in the US, the Recording Academy has been slow to recognise the shift. Coming into the night, no hip-hop artist had ever won song or record of the year, and 15 years have passed since a hip-hop act last received album of the year. Outkast won in 2004 for ‘Speakerboxx/The Love Below’. The repeated snubs came to the fore when the New York Times reported that Drake, Kendrick Lamar and Childish Gambino turned down invitations to perform. Lamar has already given a couple of the most arresting and memorable performances in recent Grammy memory, and industry figures were gossiping all week about whether the acts would even show up for the show. Childish Gambino did not.